I love FanFest. And if the huge number of fans in attendance last year is an indication, so do most of you. I’ve had a few different roles at FanFest in the past, and have had a blast every time. Last year, I got to run around and be a fan with my niece and nephew, who couldn’t get enough of the many inflatable play areas. 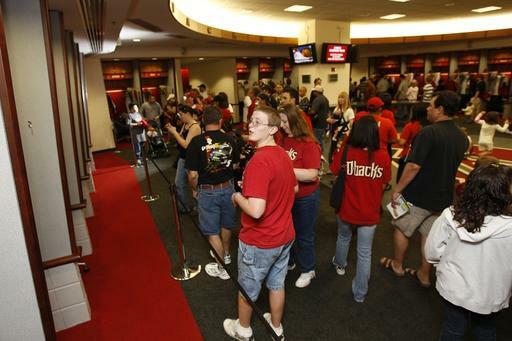 On Saturday, the D-backs will host the sixth annual SUBWAY D-backs FanFest at Chase Field from 10 a.m. to 5 p.m. Fans who purchase two Fresh Value Meals at participating Phoenix-area SUBWAY locations, however, can enter Chase Field an hour early, at 9 a.m. Hurry though, that offer is only good through today. 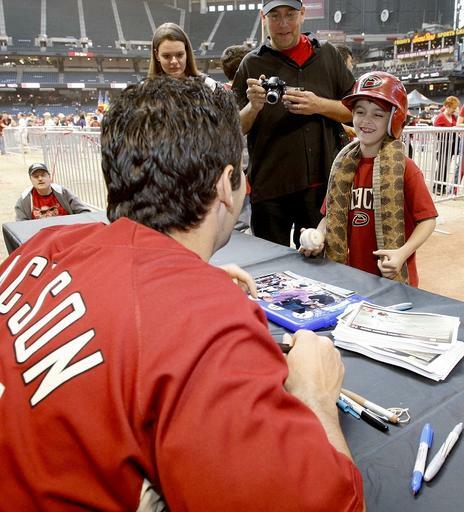 D-backs players will participate in Q&A sessions and autograph signings, with all proceeds from autographs going to the Arizona Diamondbacks Foundation. It’s a virtual certainty that you’ll have access to your favorite D-backs player or coach, as Manager A.J. Hinch, Brandon Webb, Dan Haren, Justin Upton, Mark Reynolds, Chris Young, Conor Jackson and many more are all slated to appear. One of the popular aspects of last year’s event was the presence of D-backs alumni, which will continue this year with Kelley Stinnett and Quinton McCracken. Of course, former D-backs third baseman Matt Williams will be there, as he is now a member of the D-backs coaching staff. 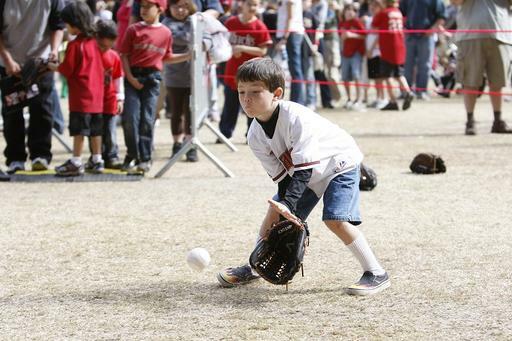 The same things you’ve loved about SUBWAY FanFest in the past will be included this year, such as tours of the D-backs’ home clubhouse, D-backs Training Centers Wiffle Ball fields and practice clinics, Family Fun Zone with speed pitch and interactive inflatables, a sports card and memorabilia show, the Arizona Diamondbacks Foundation yard sale and a silent auction hosted by the D-backs wives. If you think you’re a great, die-hard fan, make sure to wear your D-backs gear for FOX Sports Arizona’s “Be a Fan” campaign. 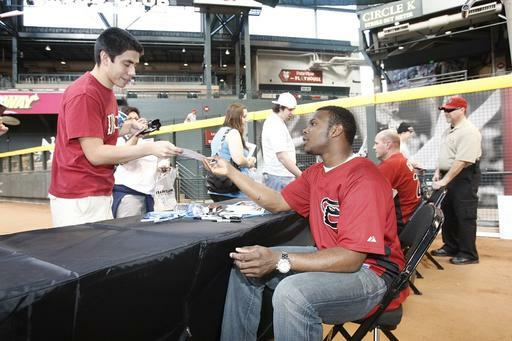 They’ll be taping promotional spots with D-backs fans at a booth near the first base dugout. The network is looking for fans of all ages to show their support for the team. I’ll be posting here a few times on Saturday, so check to this blog for some observations, photos, audio and (hopefully) video. And if you see me wandering around FanFest, please do stop and say hello. Here are a few more photos from last year’s event. MLB.com columnist Peter Gammons wrote Tuesday about the storylines to keep an eye on in Spring Training this year. And with much of the attention focused Brandon Webb’s way, it’s nice to see Gammons point to the significant addition the D-backs are making to the lineup this year. Conor Jackson, D-backs. When one looks at Jackson’s 2009 line, it is hard to believe: 30 games, one home run, .182 average, .516 OPS. Ugh. The correct diagnosis was finally made, Jackson was treated and returned to health. He played in the instructional league, the Arizona Fall League and spent weeks in the Dominican Winter League. Just one player on the Keith Law 100 over at ESPN, and not surprisingly it’s ace righty Jarrod Parker. Parker was his usual 92-97 mph and even touched 99 in his last outing, and he had made more progress with his changeup after deliberately working on it more in games, to the point where on his best days he could show four above-average or plus pitches…. …Once rebuilt — and there is the technology — he should resume his march to the top of a big league rotation after another full year or two in the minors. Good to hear another writer (we mentioned Baseball Prospectus’ Kevin Goldstein last week) who is confident that Parker can return to his potential All-Star form when he’s recovered from Tommy John. Burgos did not have a great season at Missoula last year, but his combination of size and stuff definitely makes him somebody to keep an eye on. — Law wasn’t quite as high on Brandon Allen as Goldstein is, but it’s worth noting that he is quite a bit higher on 2009 first-round pick A.J. Pollock, who D-backs Scouting Director Tom Allison raved to us about last year. Definitely keep your eye on Pollock; he’ll be a fast riser through the minors. — Law has Davidson just a tick ahead of Borchering, while Goldstein had Borchering significantly higher than Davidson. This debate actually goes back to the draft, when baseball people seemed split between the two (which explains why they were drafted so close together: Borchering, 16… Davidson, 35). In short, Davidson was generally seen as the better power guy (some saying he had the best power in the draft), while Borchering has the big advantage of being a switch hitter. For prospect-info nerds like me, today is like a second Christmas. Kevin Goldstein over at Baseball Prospectus released the Top 11 Prospects (because that’s better than 10) for the D-backs today. Here’s the link: http://baseballprospectus.com/article.php?articleid=9958 (subscription required). Goldstein does a fantastic job with these lists — one for every organization. He’s very thorough with his research. The promotion of prospects to the Major Leagues over the last four years (Drew, Upton, Reynolds, etc.) and trades — Dan Haren, for example — left the D-backs’ system a little thinner than it had been earlier in the decade. That’s not necessarily a bad problem to have, since it generally a sign of rapid big league promotion among your young players. So in that vein, you’re going to see a lot of new names. A stunning eight of the top 11 were drafted in 2009. Anyway, on to Goldstein’s list. — Goldstein sees Parker as an elite prospect, which is good to see. He noted in the comments section that Parker surely would have been a five-star prospect — and probably a top 25 overall prospect — if not for the arm injury that will sideline him in 2010. However, his rehab is going well, so while it may cost him a year of development, it may not actually cost him any of that excellent ability that made him a top prospect to begin with. Perfect World Projection: If he comes back 100 percent, he’s an All-Star. — Goldstein is still high on Brandon Allen, which is great. Allen took some flak for struggling at the plate in the Arizona Fall League, but the D-backs still believe in him long-term. There shouldn’t be any rush on Allen — he’s due for a full year at Triple-A anyway — so the signing of Adam LaRoche takes the pressure off, and hopefully leads to Allen raking for a year at Reno. The Good: Allen has a solid approach and enough bat to profile as an everyday first baseman in the majors, combining plus power with a surprisingly solid contact rate, leaving scouts to project him as a .280+ hitter with 20-25 home runs annually. — It’s great to see Ryan Wheeler on this list. The fifth-round pick last year stunned a lot of prospect watchers with his huge professional debut. Wheeler is definitely a guy to keep your eye on this year. — Right in the middle of this list is Keon Broxton. Keep your eye on him, too. And be patient. Even at the time of the draft, it was clear that he was a total upside pick. He’s got some work to do to, but he’s a pretty spectacular athlete (he played wide receiver at Florida International University). We can’t reprint everything here, so you’ll have to head over to BP to check it out. If you don’t have a Baseball Prospectus subscription, they aren’t that expensive, and definitely worth it. In related news, Keith Law’s Top 100 prospects over at ESPN is due to be released on Jan. 28. We’ll check back in then to see what we’ve got for a D-backs presence on that list. Well, it is official: Adam LaRoche is a D-back. After rumors swirled for a day or two, the deal was announced Friday afternoon, with the veteran first baseman signing a one-year deal with an option for a second. It should work quite well for the D-backs on many levels. LaRoche is a good defender at first base and a good left-handed bat to put alongside Miguel Montero in a middle part of the lineup that was pretty right-handed before (Jackson, Upton, Reynolds). Furthermore, he’s a good-power, good-on-base player and with those five above-mentioned players, that should be a formidable group. With solid seasons from Stephen Drew and Kelly Johnson at the top, the D-backs are looking at some offensive lineup improvement over 2009. For what it’s worth, LaRoche has done very well against teams in the NL West. Check out his numbers against the D-backs’ chief rivals in what would amount to just less than a full season: 137 games, 32 home runs, 40 doubles, 92 RBI, 80 runs, a .301 average, .360 on-base and .584 slugging (.944 OPS). Those are excellent numbers. LaRoche is pretty famously a second-half player. For whatever reason, he’s just always gotten better and better as the season as gone on (which, one supposes, is always a better reputation to have than being a hot starter/cold finisher). So even if LaRoche doesn’t explode out of the gate, don’t then presume something is wrong; the history shows he’ll likely blow up pretty well in the second half. As an aside, the LaRoche move allows the organization to be patient with young first baseman Brandon Allen, who can go into Spring Training working with hitting coach Jack Howell and the D-backs staff on his specific offensive goals, without the added pressure of fighting for a starting spot. After watching Wednesday’s Baseball Hall of Fame announcement, now go ahead and mark your calendars for this week in 2015.The first player to wear an Arizona Diamondbacks cap on his plaque will be enshrined in Cooperstown. Randy Johnson announced his retirement Tuesday after 22 seasons in the Major Leagues. Johnson’s accomplishments are too many to list entirely, but here are the big ones: 303 wins, 4875 strikeouts, 10 All-Star appearances, five Cy Young Awards (four of them consecutive), a perfect game, a no-hitter and a World Series MVP. In addition to the D-backs, Johnson played for the Montreal Expos, Seattle Mariners, Houston Astros, New York Yankees and San Francisco Giants. And while Johnson was noncommittal during his retirement speech about what cap he would like atop his Hall of Fame plaque, it will surely be a D-backs logo because of the four Cy Young Awards and World Series championship he won in the Valley. 1. Johnson’s adjusted ERA (ERA+) is ninth-best all time among pitchers with at least 2,500 innings pitched. The top 10: Pedro Martinez, Lefty Grove, Walter Johnson, Ed Walsh, Roger Clemens, Mordecai “Three-finger” Brown, Cy Young, Christy Mathewson, Johnson and Pete Alexander. Wow, that’s really good company. 2. Johnson’s 4,875 strikeouts are second all-time, trailing only Nolan Ryan. 3. It will be a long time — if it ever happens at all — before anybody makes a run at that number. The closest active pitcher is Pedro Martinez at 3,154. To put it into perspective: For Martinez to reach him averaging 150 strikeouts per season, it would take Pedro more than 11 seasons, and he would be 48 years old. 4. The closest pitcher under 40 is the former D-back that came to Arizona in the trade that sent Johnson to New York: Javier Vazquez, at 2,253. Vazquez has averaged 205 strikeouts the last five seasons. Even if he managed to keep up that pace, it would take him nearly 13 seasons, when he would be 45. 5. The active pitcher who, barring injuries, will probably finish closest to Johnson is 29-year-old Yankees lefty C.C. Sabathia at 1,590. He’s averaged 198 whiffs per year over the past five seasons. If he managed to stay healthy and maintain that pace, it would still take him more than 16 seasons to match Johnson, and he would be 45. 6. Put it this way: the 3,000 strikeout mark in a career is a prominent milestone. And Sabathia is more than that entire milestone away from Johnson. 8. 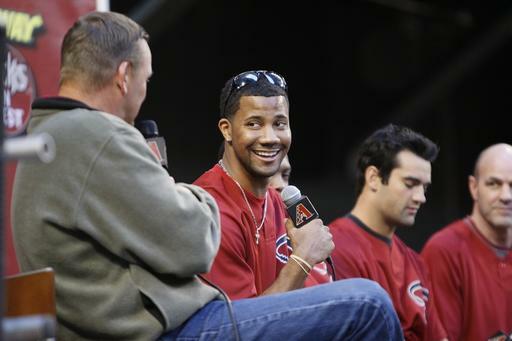 Johnson led the league in strikeouts nine times, including five of his six years with the D-backs. 10. Johnson’s 10.61 strikeouts per-nine-innings mark is the best of all time among pitchers with at least 1,000 innings. The rest of the top 5: Kerry Wood, Pedro Martinez, Nolan Ryan and Trevor Hoffman. 13. Johnson retired with the second-most innings pitched among active players, trailing only fellow lefty Tom Glavine. 15. In addition to winning four CY Young Awards, Johnson also finished second three times and third once. 16. Johnson received MVP votes in nine seasons, including two top-10 finishes. 17. Johnson retired first among active players with 100 complete games. Glavine is a very distant second with 56, and the closest under-40 pitcher is new Phillies righty Roy Halladay, with 46. 19. In Randy Johnson’s 2004 perfect game against the Atlanta Braves, not only did no one walk (obviously), but only one batter even reached a three-ball count. The result? Of course, a full-count swinging strikeout against Johnny Estrada. 21. Rickey Henderson might have been the greatest leadoff hitter ever, but he struggled to put his bat on the ball against Johnson. Though Henderson drew 26 walks in 85 plate appearances, he got only seven hits, batted .119 and struck out 30 times. No batter faced Johnson more times than Henderson. 22. Ten batters were struck out at least 20 times by Johnson in their careers. They were: Henderson, Dean Palmer, Sammy Sosa, Jim Leyritz, Tim Salmon, Marquis Grissom, Chili Davis, Devon White, Phil Nevin and Jeff Cirillo. 23. Cirillo was one of Johnson’s most famous victims. The Big Unit recorded his 4,000th career strikeout in a home game against Cirillo on June 29, 2004. 24. Johnson dominated the NL West. His numbers against the Colorado Rockies: 29 games, 19-8 record and a 2.47 ERA with 251 strikeouts in 211 1/3 innings. 25. Against the Los Angeles Dodgers: 25 games, 8-7 record with a 3.09 ERA and 188 strikeouts in 166 innings. 26. Against the San Diego Padres: 28 games, 16-5 record with a 2.44 ERA and 257 strikeouts in 191 2/3 innings. 27. Against the San Francisco Giants: 24 games, 8-8 record with a 3.13 ERA with 180 strikeouts in 158 innings. 28. The opponent he dominated most was probably the Chicago Cubs. He pitched 15 games against the Cubs, with a 13-0 record and 1.91 ERA, with 143 strikeouts in 103 2/3 innings. 30. In addition to his dominance, Johnson was also a pillar of durability. He had 440 games of 100 pitches or more, second-most since 1980 behind Roger Clemens. Only six pitchers in that span have more than 300. 31. Among catchers who caught Johnson at least 20 times, he dominated hitters best with former D-backs backstop Damian Miller. The battery held hitters to a .270 on-base percentage, a slugging percentage, and struck out 1020 batters compared to just 199 walks among 2903 plate appearances. 32. Johnson is one of only five pitchers in baseball history to have been 6-feet-10 or taller. 34. In his final game with the D-backs, Randy turned back the clock to show something reminiscent of his old self. He threw a complete game against the Colorado Rockies on Sept. 28, 2008, allowing just two hits and one walk with nine strikeouts. 35. 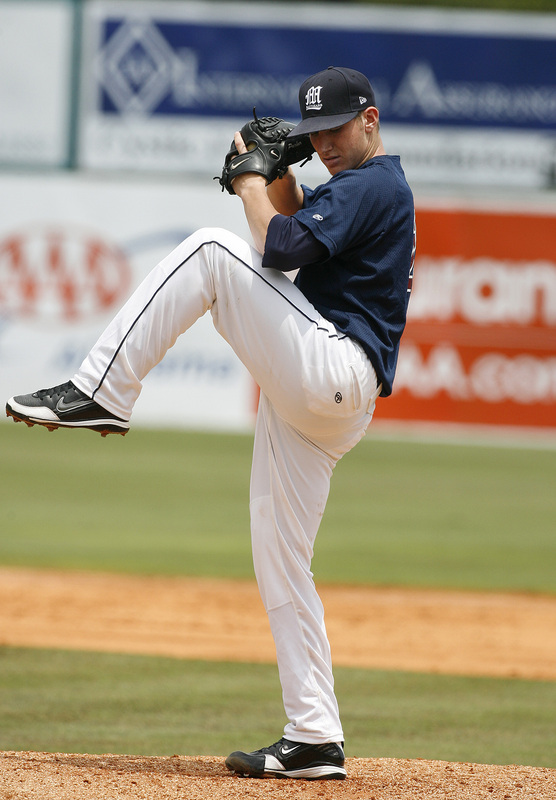 In his last 15 starts with the D-backs in 2008, Johnson went 9-6 with a 2.56 ERA and 91 strikeouts in 98 1/3 innings. 37. He did quite well against batters on this year’s Hall of Fame Ballot. Andre Dawson hit .133 in 15 at bats against Johnson. 38. Roberto Alomar hit .200 with 13 strikeouts in 40 at bats against Johnson. 39. Tim Raines hit .259 with only one extra-base hit and seven strikeouts in 27 at bats. 40. Barry Larkin hit .200 with just one extra-base hit in 30 at bats. 41. Though Mark McGwire hit a famous home run off Johnson in the Kingdome in Seattle, Johnson mostly dominated him. Big Mac hit .225 with 18 strikeouts in 40 at bats. 42. Finally, Johnson held Fred McGriff hitless in 10 plate appearances with three strikeouts. 43. Since 1980, Johnson holds six of the 25 greatest single seasons, sorted by ERA+. No pitcher has more. 46. Of all of his home parks (with the exception of the Astrodome, where he pitched just five times), Randy was probably at his best at Chase Field, where he held the highest strikeouts-per-nine innings (11.5) to go with a 2.96 ERA, a 65-34 record and 1138 strikeouts in 891 1/3 innings. 47. 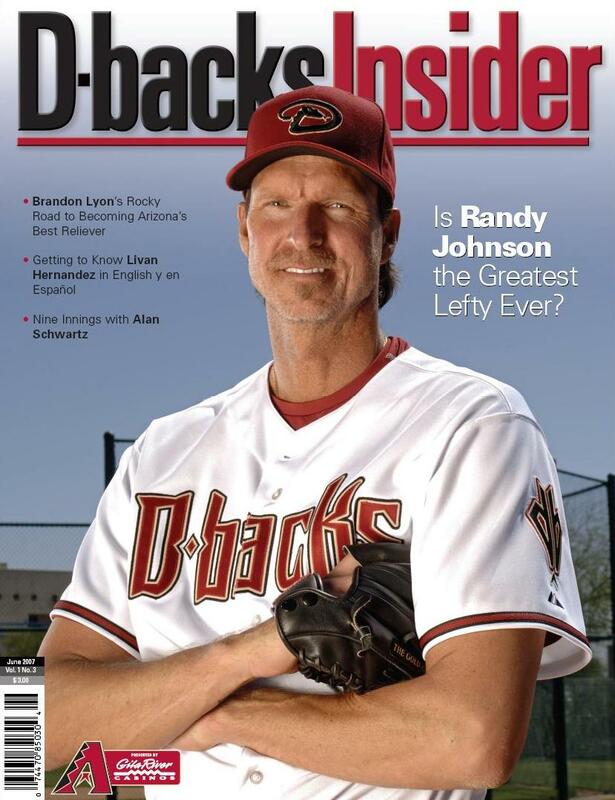 Randy Johnson had 212 games with at least 10 strikeouts, second-most all time behind Nolan Ryan’s 215. The next closest to Johnson, Roger Clemens, has just more than half of Randy’s total, with 110. Only Ryan, Johnson, Clemens and Pedro Martinez have more than 100. 48. Johnson is one of only 13 pitchers to have multiple no hitters in their career. Only Nolan Ryan and Sandy Koufax ever had more than two. 49. Randy Johnson was 40 years old when he threw his perfect game against the Atlanta Braves. He and Nolan Ryan are the only two pitchers to ever throw a no-hitter after their 40th birthday (Ryan had two), and Johnson is the only 40-plus year old to throw a perfect game. 50. In the 2001 World Series, Johnson won three games and posted a ridiculous 1.04 ERA with 19 strikeouts and three walks in 17 1/3 innings. 51. The final pitch of Johnson’s career was, of course, to record a swinging strikeout. Johnson whiffed San Diego Padres All-Star first baseman Adrian Gonzalez to end the 7th inning of the Giants’ game on Oct. 4. The D-backs signed right-handed pitcher Rodrigo Lopez to a minor league contract Wednesday, with an invitation to big league camp. The 34-year-old Mexico native (happy birthday to Rodrigo, by the way… he turned 34 on Monday) has a 68-66 record and a 4.95 ERA in eight Major League seasons. 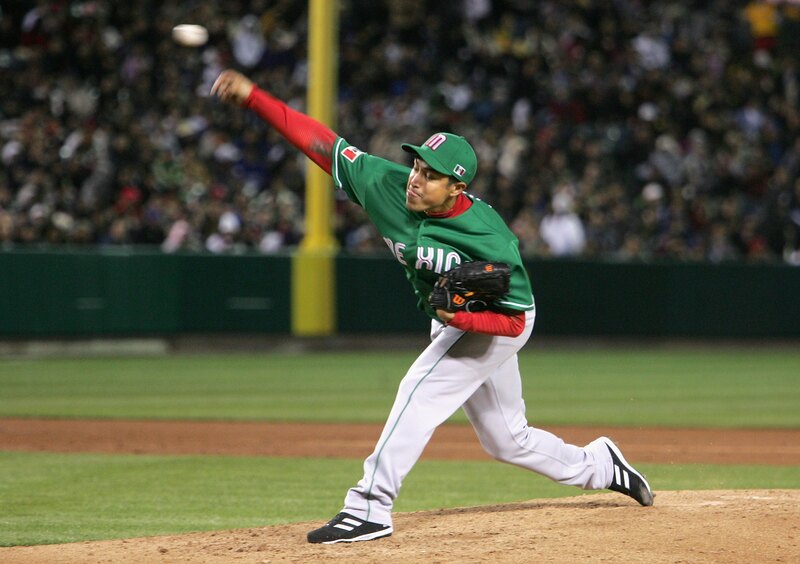 He has also pitched for Team Mexico in the World Baseball Classic (the above photo is from the 2006 tournament). He had an excellent rookie year with the Baltimore Orioles in 2002, going 15-9 with a 3.57 ERA. He had 136 strikeouts and 62 walks in 196 2/3 innings. Injuries derailed him after that, though, including an elbow injury that required Tommy John surgery in 2007. He pitched for the first time in nearly two years when he came out of the bullpen for the Philadelphia Phillies on July 3 of last season. All in all, it’s a good, no-risk move for the D-backs, adding a veteran arm to the mix of players vying for the few available spots on the pitching staff. 8. Diamondbacks: GM Josh Byrnes is right that special starting pitching is needed in the NL West, and to that end, Edwin Jackson gives them a superb top three along with Brandon Webb and Dan Haren, who’s one of the best No. 2 starters in baseball, if not the best. Kennedy wasn’t going to be able to hack it with his soft stuff in the AL East, but Arizona believes it will translate better in their far less powerful division. They weren’t sure Max Scherzer has a varied enough repertoire to become a star in the rotation, but others think otherwise. In any case, it’s always better to trade relievers for starters and the deal Byrnes instigated clearly helps them in the short run. (Kennedy) showed in the recent Arizona Fall League that he still carries the potential to fill a rotation slot in the National League. Nobody sees the Arizona league more than the D-backs, and they obviously were impressed with Kennedy, who had 28 strikeouts and just five walks in 29 2/3 AFL innings, reaching the low 90s on the radar gun.